As we enter the final stretch of the Halloween season we now turn our eyes to the origin of the holiday, Samhain. And since this is Fanboy News Network I am going to tie it back in with geek culture by the end. Before I even get into what Samhain is/was/isn’t/whatever I want to tackle one of the trickiest subjects of all, how to pronounce it. You see Samhain is a Gaelic word and so its pronunciation has nothing to do with how our eyes accustomed to modern English see it. When you look at it I am sure that you assume it is pronounced Sam (as in the common first name) hane (rhyming with bane). And you would be wrong. In fact it is pronounced Sow (like the pig) in (as opposed to out). We will get back to fun with pronunciation later. So what is Samhain and how does it relate to Halloween? Well to answer that we need to look to our old friends the ancient Celts. It’s easy to think of the Celts as a superstitious people who spent most of their time painted blue and hitting things, but really they were a very practical people who incorporated their spiritual lives into their everyday lives. Due to this a lot of their holy days tended to line up to practical matters like planting or harvesting. It is also good to keep in mind the harsh climate they lived in. Finally you have to remember that they did not look at seasons the same way we do. To them there were two seasons, summer and winter. So for Samhain, the first thing to know is that its literal translation is “summer’s end”, meaning it was when they marked the beginning of the winter season. Or to put it another way, it was the Gaelic word for November. The festival of Samhain was the feast that they would have to mark the occasion. It was also when they would bring in their livestock from the summer pastures and slaughter any animals to provide food for the winter. Due to this last bit it was sometimes known as the blood harvest. On the spiritual side of things it was a time when the barriers between the worlds of the living and the dead were thought to be thinnest. Many traditions that we think of as Halloween traditions were born out of this belief. People would dress in ways they normally didn’t to confuse spirits that meant harm, turnips were craved into frightening faces to scare off evil spirits and offerings were left out for the beloved dead. Thus we have costumes, Jack-o-lanterns, and trick or treating for candy. 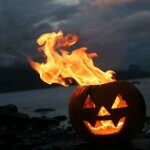 For the Celts Samhain was the beginning of their year and the festival of Samhain their most important holy day. I’m sure you have, and let me take this time to explain why this is wrong. In the 18th and 19th centuries in England the practice of armchair academics was very popular. These were amateurs in various sciences who would do research and get published without any actual field experience. I have always held the belief that the kind of people that did this would be what Monty Python would refer to as an Upper Class Twit. One such individual was Col. Charles Vallency, who wrote a 6 volume set of books in 1770 that attempted to prove that the Irish people once came from Armenia. This work has the first reference that can be found naming a god called Samhain. This concept would be picked up by Godfrey Higgins in 1827. Higgins wanted to prove that the Celts originally came from India. Now today there is scientific evidence that backs this up, but the field work that proved it had not been done yet in 1827 and Higgins needed something to prove his theory. In his research Higgins came across Vallency’s work and picked up on the idea of calling a god Samhain. He found a Hindu God named Samana, and figured he had his hook. But he needed a mythology to go with Samhain to make this work. Finding reference to the blood harvest it was an easy step to go from a sensible practice to survive the winter to a festival of ritual sacrifice to appease a pagan god. And the belief of the dead roaming the land made Samhain a god of the dead, terrorizing the people as the cold set in. And this BS is what stuck in a lot of people’s minds. For years if you did a search on Samhain on the internet all you would find would be references to a “Lord of the Dead”. Fortunately decent research in more recent years has drowned those pages out and most information you find is in the neighborhood of accurate. Well unless you are talking about mass media, then all bets are off. It seems that when you want to do a TV show or movie involving Samhain that last thing you want to do is actual research, especially when the BS is so much more fun. One example that I always think of is an episode of the TV show Supernatural. Now this show has always had its issue when it comes to research. Don’t get me wrong, I like this show, and watch it regularly. When they are working from a mythology they create no problem, but whenever they try to work in any existing folklore, not so much. Let’s put it this way, my sister and I have a game where we predict when the other is going to start flailing at the screen because they got some piece of lore wrong. When they did their Samhain episode she actually called me and said “are you yelling at the screen yet?” The answer was yes by the way. They basically took Higgins’ story and used it whole cloth, adding that Samhain was helping bring about the apocalypse. Another is the otherwise really fun horror movie Trick r Treat. It’s iconic character is Sam who looks like a little kid in a pumpkin mask, but is in fact Samhain who acts as the spirit of Halloween. But really it was the cartoon the Real Ghostbusters that solidified the use of Samhain as the spirit of Halloween. In multiple episodes they had a pumpkin headed baddie called Sam Hane who wanted to make every day Halloween. As for shows that get a bit closer to the facts, even they can have issues. True Blood for example almost drove me to drink. They did great on the Samhain mythology, but their pronunciation was like fingernails on a chalkboard. They pronounced it Sama Hane. I have no idea where they got that extra A from. Another show that was not annoying was the show Reaper, about a guy who ended up stuck working for the Devil. In one episode the Devil lamented that he missed the festival of Samhain, and nailed the pronunciation. His mythology was a bit off, but better than most. The one show I can cite that nailed it on the head was American Horror Story last season. They opened their Halloween two part episode with a character accurately describing the old Samhain traditions, getting both pronunciation and history correct. The best part was that since the story was about ghosts, they were able to take the accurate information and make it relevant to the plot. So there we have it, a look at what is and isn’t true about Samhain. So when you go out this year, remember that there was no blood god wanting sacrifices, just a people getting ready for winter and honoring their beloved dead. This entry was posted in Article and tagged American Horror Story, Geek Culture, Halloween, samhain, supernatural by Caliban. Bookmark the permalink. Nice way to tie it in to all the media we like! As good geeks we have to be aware that most of the time TV gets it wrong! May readers not familiar with Samhain be enlightened and tempted to look into it themselves.